The capital of Sumatra, Padang offers a compact and enjoyable cross-section of Sumatran life and its various cultures. Many surfers stop here on their way to the Batu or Mentawi Islands, but the town itself boasts a few noteworthy attractions such as the Adityawarman Museum, which features a collection of antiques, and the cultural centre where locals perform traditional dances on Sundays or even pencak silat (martial arts). 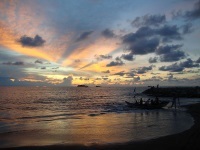 Many people come here for the markets, for which Padang is famed, but Padang Beach is also popular for its spectacular sunsets and hundreds of colourful food stalls. Another popular beach is Air Manis, which gets mixed reviews from tourists - depending on how clean it is when they visit - but boasts the attraction of a small island which can be waded to at low tide. Lake Maninjau is close enough to make a really pleasant excursion from the city, and Sikuai is less than an hour away by boat. Sikuai Island is renowned for its natural beauty and earns rave reviews from almost all that make the trip. Although not cheap it is still relatively unspoiled and feels like an undiscovered paradise. Padang makes a good base for excursions of this sort and is in close proximity to a number of lovely areas.